Celebrating the life of Walter J. Brown Jr.
Obituary for Walter J. Brown Jr.
Walter J. Brown Jr., age 92, passed away Saturday, March 16, 2019 at Swanton Valley Care Center. He was born November 1, 1926 in Toledo to Walter J. and Dorothy M. (Ames) Brown Sr. Walter was employed by the Jeep Corporation as a Journeyman Auto Mechanic. He enjoyed traveling to destinations across the country. 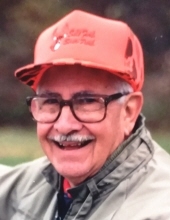 Walter loved fishing, hunting, and camping, especially at Salt Fork State Park. He was a parishioner of St. Michael the Archangel Church. Walter is survived by his wife of 69 years, Kathryn Brown; children, Catherine (Gary) Maddock, Jean Lane, Elaine (Gary) Allard, and Christopher Brown; 6 grandchildren; 14 great-grandchildren; and 1 great-great grandchild. He was preceded in death by his parents and sister, Audrey Eaton. Family and friends may visit Thursday, March 21 from 10 am- 12 pm at David R. Jasin-Hoening Funeral Home, 5300 N. Summit St. Toledo, OH, followed by interment in St. Ignatius Cemetery. A Memorial Mass will be held on Friday, March 22 at 11 am in St. Michael the Archangel Church, 420 Sandusky St. Toledo, OH. To send flowers or a remembrance gift to the family of Walter J. Brown Jr., please visit our Tribute Store. "Email Address" would like to share the life celebration of Walter J. Brown Jr.. Click on the "link" to go to share a favorite memory or leave a condolence message for the family.